This switched compact unit contains 12 resistors, with preferred values in the range 100Ω to 470Ω mounted on a printed circuit in a robust black plastic box. Selection is via a rotary switch. External connections are by means of two 4mm yellow terminals, the colour indicating non-polarity. The tolerance of the resistance values is 5%. 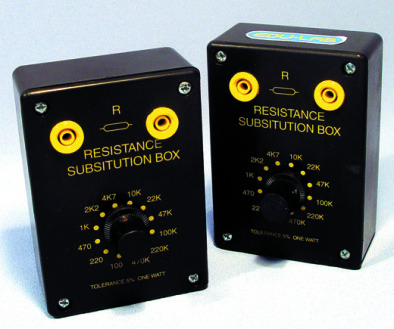 However, as is quite common, resistances can be closer to their nominal values. All the resistors have a maximum power rating of 1W.